IHG has announced that a Hotel Indigo will open in Venice next year. 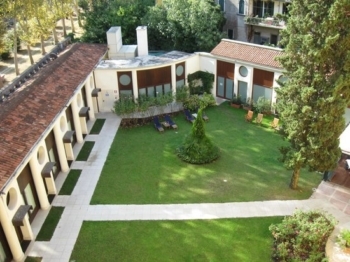 Hotel Indigo Venice Sant’Elena will be located next to the canal ‘Rio Sant’ Elena’, within walking distance to the Castello district, a 15-minute walk from St Marco Square. This is one of the quieter areas in Venice. Converted from an old convent built in the 1930’s, the 77 room Indigo has two wings joined in the centre by a former chapel. The hotel already operates as a Best Western Premier – the website is here – but will be remodelled before reopening as a design-led Hotel Indigo. A photo of the courtyard is below. A 51-room boutique InterContinental was due to open in Venice this year, but that project has gone very quiet indeed and is no longer mentioned on ihg.com. We can be pretty certain that the Hotel Indigo conversion will actually happen. You can read more here. As we saw with the Qatar Airways sale this week, the best long-haul business class deals tend to involve starting outside the UK. This is partly due to high UK Air Passenger Duty but mainly because the UK remains a strong market. Qatar Airways finds it harder to fill two planes a day from Oslo than six planes per day from London. This is why KLM’s sale is worth a look – click here. Other routes are also available as you can see here. Booking and travel dates are very vague unfortunately but it is worth playing around with the options. I am not fully up to speed on which aircraft have which seats at the moment so, again, you will need to do some digging. KLM is a member of SkyTeam so you will be crediting your flights to KLM’s Flying Blue programme or another SkyTeam programme such as Delta SkyMiles. I wrote this article showing the 18 UK airports from which you can fly on KLM to Amsterdam and then onwards. 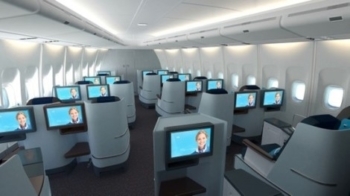 The KLM business class deals are here. I get a lot of emails from readers who tell me of all the great places they have been able to visit and all of the great hotels they have been able to stay in as a result of reading Head for Points. I’m always pleased to receive them. This week I got a similar email from reader Dave. Dave, despite being only 49, has incurable lung cancer – despite having never smoked – and is unlikely to see out 2019. HFP has helped him spend much of the last year travelling so he can see the world whilst he has the chance. His travel blog, here, is worth a read, if only to remind the rest of us how fortunate we are. Amazing blog – what an inspiration to all of us and a lesson to keep our own ailments in perspective. The comments on Avios not being inheritable is interesting. First, admittedly it was some 15 years ago but I managed to get BA to pass my late father’s avios over to me. Second – a suggested work around – set up a “household account” with the person you want to receive them (BA don’t do checks on residence at the same address) and then they will be able to use them once you are gone. In reality if an executor writes to ask Avios seems to do it. We did an article on this once. Agreed, Alaska is a great option to credit AF/KLM flights to. Bare in mind though that it will not be possible to credit flights after the 1st of May. Alaska also a fantastic place to credit BA flights to if you’re not looking for BA status. There are some real gems in the Alaska award chart. Dave, I’m sat in the BA LHR lounge, just back from KUL and waiting on connecting flight and reading your blog and nodding my head in agreement on your thoughts on your travel experiences. Thanks for sharing all your experiences, and all done so eloquently. Wish you all the best for your travels and health, you will be in my thoughts. Dave, to echo CV3V’s thoughts, the blog is a great read and you’ll be in my thoughts. Your reaction to such a tragic set of events is very inspiring. Best wishes. An amazing blog. I have a family member going through something very similar and my wife has had a ‘ near miss’. We should all make the most of the time we have. I admire Dave for his courage and honesty….thanks for sharing. Dave, your blog is an uplifting story in which your zest for life, courage, compassion and good humour shine through, showing us all that they triumph over sorrow, pain and despair. All the best. Dave. Brave man and what a positive attitude to boot. It’s not about being down or feeling sorry but it’s a reminder about life and how precious we are being on this planet. My brother passed away in sept 2017 from a brain haemorrhage. He wasn’t ill and knew nothing of it in fact had just reached BA silver from a holiday the week before. We had no notice whatsoever to even begin to take it in. I had a call to say he’s on a life support machine nothing can be done and within two weeks he had passed away. He would have been 44 in two weeks time. To say its devastated us a family and his wife is an understatement but we battle on people like Dave are brave not me for coping in life. So now with 150k Avios saved up and more planned I was actually going to email rob and ask for suggestions on the best use of them for us a family of my wife and four year old…..I think we need a holiday! A fantastic read of Dave’s blog (through some watery eyes). Just shows how precious life is but how cruel it can be too with the C word. I haven’t read the blog as I would find it too upsetting but I echo Graham’s comments. I hope a miracle happens, for Dave, and a cure is found. You should read it, and thats coming from someone who freaks out at the fact people can just get ill from out of nowhere. Its emotional to read but you come away admiring him and actually being pleased for him that he is travelling and dealing with it 100 x better than I ever could! Same here – very watery. Well written. OT; no fee to top up Revolut using a credit card now thanks to new EU directive. Can top up using Tesco credit card for some Clubcard points on your foreign spend now! Will the credit card treat the top up as a purchase or cash withdrawal? OT but IHG: I stay at CP Aberdeen Airport from time to time and something feels off about their rates at the moment. They are now consistently showing as £10-20 higher at weekends than they have been since opening. Furthermore, the rate descriptions are all park and fly rates or package deals, none of the usual IHG staples like ‘your rate’ or bonus points. Makes me wonder if they are planning on quiting IHG so I’m reluctant to make a reservation there at the moment on which my accelerate target might depend. I understand the hotel sector in Aberdeen is now recovering quite well from the last few years which would explain tbe price hikes but not the odd rates. Go to the HIE right next door….between the 2, much prefer the HIE. We had a really unimpressive , uncomfortable stay at CP,which put me off. Subsequent HIE stays were miles better! Cheaper/ less points depending on how you want to pay., and the staff were friendlier too! Thanks, we would do except my partner needs brands for accelerate. We have done ok at CP, got upgrade every time, and when I was spire I once got breakfast and lounge too fof sonething around £45. We have stayed next door twice too and had no complaints, I take you have noticed the rooms or almost identical except for small differences in furnishings? We might pop down to Newcastle for a change and try Staybridge. The CP opened just in time for the oil price drop, which has started to recover. During the week the oil companies block book hotel rooms in Aberdeen ‘just in case’, so there are a load of empty paid for hotel rooms. That said, wonder if CP are falsely fiddling the rate packages to get more cash per stay. I called reception to enquire and was curtly informed to call back on Monday regarding the rates. I’ll callagain just to see what they say. Are you planning on giving the MAS a350 a try or are you sticking with BA redemptions? At T5 the E gates are now in operation for transferring onto domestic, good for me as no queue, not good for partner on foreign passport who had a 30 min wait in queue. My sticking with BA is due to using up avios combined with BA 241 voucher, but now more than ever i am looking for excuses not to stick with this approach. I am hoping for good things for the MAS A350, also hoping they will put one back on to AMS and reinstate the route so could avoid LHR. I think you can always tell when servicd is going to be old school or not, if tge average age of the cabin crew is under 40 it can much increase the likelihood of poor service IME. However, I was perfectly happy with the young crew on my last flight both in and oug off BKK this time. Where are these e-gates, at the gates themselves (as I thought) or is it for passport control? A little confused as it’s difficult to believe your partner had 30 minute queue to board the plane, and potentially disastrous for connections too. I only go through T5 once a year now go use my avios, and I detest the experience. Are there any one stop options exScotland now other than ME3? Does the AY flight to Phuket or Krabi work for connections? The combination of good pricing, a decent hard product and ability to earn avios might make the the two stops worthwhile in comparison to MAS/ME3 cash fares. Agreed on crew experience, the crew on the BA1474 to GLA iin CE were really on the ball from the minute we boarded, old fashioned BA. Sorry, i meant the e gates they have now at the ‘UK Border’ at T5 where you have to go through for the onward domestic connections when coming off a long haul flight. So you now have the choice of queuing up or using the egate (no queue). The queues at this section used to be really bad as all passport types were in the same queue. However partner on a Malaysian passport still had to join the queue and said there were only 2 staff on duty, and once they start interrogating someone the queue doesn’t move. At that time in the morning the flights from Asia all start to arrive so passport control isnt straight forward. AY might be an interesting option with increased frequency out of EDI, and on reflection i can see the advantages. QR and EK fly into Phuket, my only concern was (again) the queue at immigration, last time i was there (Dec 2016) coming off an MAS flight the queue was an hour long to get in due to a mixture of different flights all seemingly arriving at the same time. That was in the new terminal. There is constant rumour of a direct flight from Scotland to China, but it has been so for years, just a rumour. Likewise the rumour of EK either going up to 3 flights per day from GLA or swapping out a 777 for an A380. If you only use T5 once a year, then my top tip is to never use the escalators, always find the elevators (follow the BA crew and BA Golds! ), far quicker and easier. Thanks for the feedback. From the earlier discussions I read about e-gates some time ago I thought people meant electronic boarding like many airports now offer, it was only from your comments that I realised it was most likely immigration. My partner too will now have possible issues when connecting, exacerbated by the lack of fastrack. The shorter duration and connection time with AY might just make a two stop worthwhile, moreso if you can afford the time for a short stopover in Thailand. Downside is you double the chance of a missed connection. Both Phuket, and Krabi if MAS still fly there, are avios zone 1. If connections work then you could also consider switching to *A and doing one stop to KUL with TK, I’m guessing prices are good. The shortest journey from EDI-BKK on current timetables is actually TK followed by KLM IIRC but then the cost of getting to KUL using either cash or avios is substantially higher, just creeping into zone 3 I think. An Asian carrier direct from EDI is what we most need now from my POV. This would likely hurt the ME3 Oout of Scotland though. It is now unlikely to be CX given QR are a shareholder although I suppose they could codeshare. Thai could really make it work I think as Thailand is the most popular longhaul holiday destination after Florida, and they have good connections to Oz and NZ. Might write them and suggest it. Such respect. In our thoughts and prayers. A great blog, Dave. Really made me stop and think about my priorities in life. I wish you all the best with the matrix trials. Would anybody happen to have a spare Award Wallet upgrade coupon that is not required ? Thanks. Better to ask again during the week when more people read the blog. I’ve sent him one, don’t worry. Do you still get 10k points for joining IC Ambassador club? Think that was a one off at the end of last year. OT Looking at booking my flights for this quarter. 2-3 European trips and one to MCO. I made silver last year with Virgin but doubt I’ll be able to make it to Gold. Is it worth trying to focus all travel on BA to get a status? My BA year starts next month. It really depends how much economy flying you do, how much you value seat selection priority, and whether you have alternate lounge access options such as PP. I”ve happily survived as blue for years as my longhaul flights are all premium, and my shorthaul is mostly Air Asia or Easyjet. Thanks James for the thoughts. Good to hear other people’s thoughts. I have PP and not bothered where I sit. The only value I see sticking with BA is topping up the Avios rather than more miles into my VS account. BA status is really handy if you find yourself in T5 on a regular basis. If not then I wouldn’t bother chasing it. I’m likely to drop out of Silver this year and although i’d like to keep it without sufficient regular BA flying the benefits are not worth making an effort for. Converseley if you think you have a lot of BA flying ahead of you the faster you make status the better. To the point IMO where buying unnecessary upgrades makes sense in the short term! Also trying to get Silver or Gold early in the TP year makes sense, as you get the remainder of that TP year, next year, and the ‘soft landing’ the year after. Thanks for the thoughts. Don’t think I could make silver or gold early in my year. Possibly in my 3rd quarter.